Reverse Circulation Drilling Establishes Continuity and Expands Oxide Mineralization. Vancouver, B.C… Corvus Gold Inc. (“Corvus” or the “Company”) - (TSX: KOR, OTCQX: CORVF) announces assay results from the final 16 reverse circulation holes drilled in the 2013 campaign. These results have expanded the broad oxide mineralization in the Sierra Blanca deposit in all directions and up to another 100 metres in depth. Hole NB-13-246, on the northern extension of the Sierra Blanca deposit, returned 21.3 metres @ 0.46 g/t gold from the surface (Figure 1). These results establish the continuity of quartz stockwork mineralization found 50 metres to the east in NB-12-242, which had 41.2 metres @ 0.68 g/t gold from surface, including 10.7 metres @ 1.3 g/t gold (NR13-27, October 24, 2013). 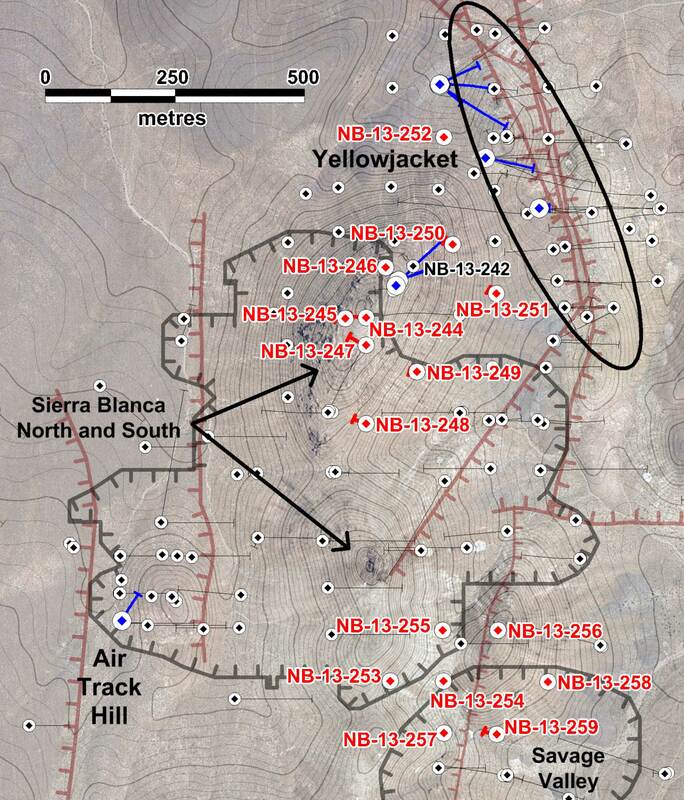 High silver values in several holes found in the North Sierra Blanca area adjacent to the Yellowjacket deposit suggests the presence of more Yellowjacket style high-grade mineralization between the two deposits. In the Savage Valley area, hole NB-13-259 returned 38 metres @ 0.51g/t gold from 18 metres depth and hole NB-13-258 returned an intercept of 11 m of 0.7 g/t gold with high tellurium mineralization similar to that intercepted a half a kilometre to the west at Air Track Hill in hole NB-13-364 (NR14-01, January 9, 2014). Corvus is still waiting for assays on the final 10 core holes drilled in 2013, most of which are from the northern and western extension of the Yellowjacket deposit. 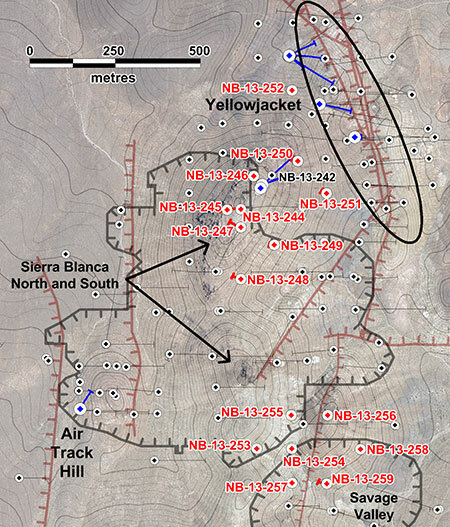 Results from nine new RC holes drilled on the northern end of Sierra Blanca have established good continuity and extended the known mineralization for about 300 metres to the north and 250 metres to the east (Table 1, Figure 1), thereby linking the Sierra Blanca deposit with the Yellowjacket deposit. Oxidation along the ridge at Sierra Blanca North extends for some 200 metres in depth, which is about 100 metres deeper than originally projected in this area. As a result, the potential to increase the tonnage of this portion of the deposit has increased (Table 1). Broad zones of disseminated mineralization, such as NB-13-244 with 77 metres @ 0.25 g/t gold, have been found in all holes. High level quartz stockwork mineralization seen at the surface has now been intersected in drilling, returning higher grades similar to those in the Yellowjacket such as hole NB-13-242 (41.2 metres @ 0.68 g/t gold from surface, including 10.7 metres @ 1.3 g/t gold – previously reported) and hole NB-13-246 (21.3 metres @ 0.46 g/t gold). Core holes NB-13-373, 375 and 376 (assays pending) were drilled to test the continuity and possible grade enhancement at depth (Yellowjacket productive depths) of these newly discovered vein/stockwork zones. In addition, holes NB-13-249, 250 and 251 not only demonstrate the continuity of lower grade disseminated mineralization, but also encountered intervals with anomalously high silver to gold ratios (Table 1, Figure 1). These values are characteristic of the Yellowjacket high-grade mineralization and indicate that the high-grade veining extends into these areas. Drilling in 2014 will be designed to investigate these occurrences as well. Table 1: Significant intercepts* from recent reverse circulation holes at North Sierra Blanca. *Intercepts calculated using a 0.1g/t gold cutoff and up to 3 metres of internal waste. Drill holes designed to evaluate a large un-drilled area between the southwest portion of Sierra Blanca and northern extension of the Savage Valley deposits have returned encouraging results which could potentially link the two proposed pits in future modeling. The results from seven new holes show that low-grade mineralization extends through this area, with some significant shallow intercepts such as hole NB-13-256, where 75 of the top 105 metres is mineralized above cutoff, and NB-13-254 with 20 metres @ 0.26 g/t gold from 8 metres depth (Table 2, Figure 1). Holes NB-13-258 and NB-13-259 both have significant intercepts at nearly 0.5 g/t gold (Table 2). Of particular interest is the intercept of 10.7 metres @ 0.7 g/t gold in NB-13-258, which also has elevated tellurium similar to an intercept half a kilometre to the west at Air Track Hill (NR14-01, January 9, 2014). As previously stated, tellurium is a strong indicator of high-grade gold mineralization. Additional drilling is planned in the Savage Valley area to explore the potential southern extension of the Yellowjacket high-grade deposit into this large area of low-grade mineralization (which has some indicators that are similar to the setting at Sierra Blanca to the north). Table 2: Significant intercepts* from recent RC holes between Sierra Blanca and Savage Valley. Corvus Gold Inc. is a North American gold exploration company, which is focused on advancing its 100% controlled Nevada, North Bullfrog project towards a potential development decision. In addition the Company controls a number of other North American exploration properties representing a spectrum of gold, silver and copper projects. Corvus is committed to building shareholder value through new discoveries and leveraging noncore assets via partner funded exploration work into carried and or royalty interests that provide shareholders with exposure to gold production. This press release contains forward-looking statements and forward-looking information (collectively, “forward-looking statements”) within the meaning of applicable Canadian and US securities legislation. All statements, other than statements of historical fact, included herein including, without limitation, statements regarding the anticipated content, commencement and cost of exploration programs, anticipated exploration program results, the discovery and delineation of mineral deposits/resources/reserves, the potential for there to be more Yellowjacket style high-grade mineralization between the North Sierra Blanca area and the Yellowjacket deposits, the potential to increase the tonnage of the deposit in the Sierra Blanca North area and for the grade to increase at depth, the potential to link the two proposed pits at the Sierra Blanca and northern extension of the Savage Valley deposits in future modeling, the potential to discover additional high grade veins or additional deposits including the potential for Yellowjacket-type high-grade mineralization in the area of low-grade mineralization in the Savage Valley area, the potential to expand the existing estimated resource at the North Bullfrog project, the potential for the North Bullfrog deposits to be p[art of a District-wide gold system and to grow as such, the potential for the North Bullfrog system to continue to grow and/or to develop into a major new higher-grade, bulk tonnage, Nevada gold discovery, the potential for any mining or production at North Bullfrog, the potential for the identification of multiple deposits at North Bullfrog, the planned completion of an updated preliminary economic assessment for the North Bullfrog project, whether in Q1 2014 or at all, the potential for the Company to secure or receive any royalties in the future, the potential for the Company to build shareholder value, whether through new discoveries and/or leveraging non-core assets or at all, business and financing plans and business trends, are forward-looking statements. Although the Company believes that such statements are reasonable, it can give no assurance that such expectations will prove to be correct. Forward-looking statements are typically identified by words such as: believe, expect, anticipate, intend, estimate, postulate and similar expressions, or are those, which, by their nature, refer to future events. The Company cautions investors that any forward-looking statements by the Company are not guarantees of future results or performance, and that actual results may differ materially from those in forward looking statements as a result of various factors, including, but not limited to, variations in the nature, quality and quantity of any mineral deposits that may be located, variations in the market price of any mineral products the Company may produce or plan to produce, the Company's inability to obtain any necessary permits, consents or authorizations required for its activities, the Company's inability to produce minerals from its properties successfully or profitably, to continue its projected growth, to raise the necessary capital or to be fully able to implement its business strategies, and other risks and uncertainties disclosed in the Company’s 2013 Annual Information Form and latest interim Management Discussion and Analysis filed with certain securities commissions in Canada. All of the Company’s Canadian public disclosure filings may be accessed via www.sedar.com and readers are urged to review these materials, including the technical reports filed with respect to the Company’s mineral properties.